The PSTAR Scrabble games is an annual event for organisations in the civil service to take part in a friendly game of Scrabble. It was held at the Civil Service Club on 15th July 2006 from 10am to 5pm. Here's my match report, with quizzes marked with [number] and the answers given at the end of the report. Don't look at the actual board positions if you are trying the quizzes. I was there a bit earlier to help draw the pairings for my team. The new Collins dictionary is used for this tournament and many players were talking about the new words to be studied. MOE, HDB and CPF had 3 teams each. A friend of mine told me that she hoped that she would not draw against MOE or HDB as they had very strong players. My first draw resulted in my team playing against MOE 2! My team mates complained a little bit when they knew their pairings. MOE 2 consisted of three ladies, Ruby, Valli and Selvi. After discussing about the lineup, it was decided that JP played against Ruby, CC played against Valli and I played against Selvi. It was a very closed board at the start. I opened with CHIZ with the I on the star, she played HA underneath and I played VAW on top. There is almost no more place to put any more tiles! The board started to open up a little bit more when I put ANY back hooking the Y on the triple letter score to the ACH on the board to score 39 points. I accidentally closed it down again when I played EAU underneath to get rid of my vowels. 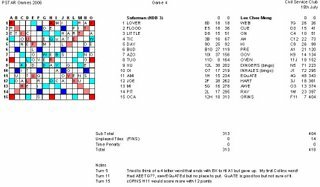 Feeling frustrated over the closed board, I opened up with REV but this seems to be a mistake as Selvi promptly put down a eight letter bingo with a DEIMOPS rack through the R for 76 points. Had AMORU?? on my rack on one turn and I phonied with AMOURed* that got challenged off! Think I overheard the word checkers on what was wrong with the spelling and I managed to put ArMOURs for 86 points on my next turn. Almost ran out of time towards the end of the game and I was lucky to put down the late Q and J that came my way. Won my first game with 409 to 307. My team also won the match 2-1! Playing in the tournament is very much like sitting for an examination! The organisers announced the end of the game after exactly one hour after the start of the master clock and everyone is supposed to drop their tiles and calculate their scores even though the individual clocks have not reached the time limit yet. Was figuring out why such a case would happen as the maths added nicely with 25 min playing time to each player and only 5 min overtime was allowed. After one day of thinking about it after the tournament, I finally realised that it was because they did not take into account the time taken for challenges which would freeze the timer. The time taken for challenges would then depend on the number of challenges per game and the average speed taken to process one challenge. My second draw resulted in my team playing against HDB 2! Oops, two bad draws in a row! JP played against a Chinese guy, CC played against Jessie and I played against Serene. 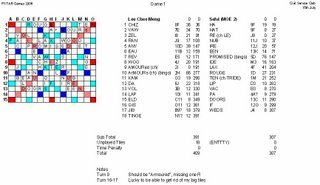 Serene started very strongly with a bingo: HOARDER for 80 points which I challenged unsuccessfully and a high scoring EXEC for 43 points! I was lagging far behind until I managed to bingo with a ACEILT? front hooking to an existing GIO on the board setting the blank as a "T". By turn 8, I was only 5 points behind but she pulled further ahead in her subsequent turns. One interesting rule that my opponents told us before the start of the game was not to turn the board around during the game but to view it sideways. I realised the rationale of this rule towards the end of this game! The board provided by the official sponsors had no grooves to place the tiles properly on it and it was not designed to rotate smoothly as it is rectangular in shape. During the course of the game, the tiles began to shift sideways even though we tried to move the board minimally. The situation was so bad that I mistakenly put down JOLE, front hooking the E to an existing TEA on the board. Due to parallax error, I thought the EA belonged to another column and noticed it only after my turn. Luckily, Serene did not see my error. She made the same mistake as I as she tried to front hook a B to the ETEA* a few turns later, but I challenged her off! Lost my second game with 360 to 432. Our team also lost the match 1-2. Lunch was provided by the organisers and it was quite delicious! After lunch, my third draw resulted in my team playing against IRAS 2. Not too bad although one of my team mates said he preferred us to play against CPF that had many pretty lady players! Our opponent is an all-girls team. 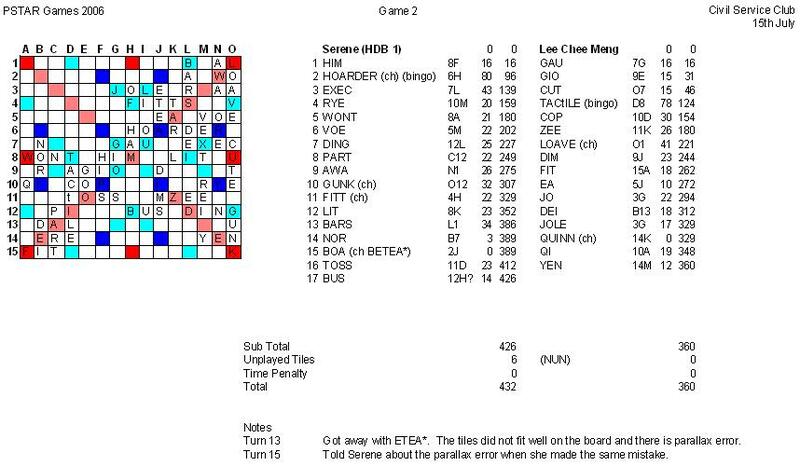 JP played against a Chinese girl, CC played against Sally and I played against a Malay girl. Lost my score sheet so can't comment on the games. Just remembered that my opponent phonied with TIB* and I phonied with CUL* for my game. We were placed in the Silver category after 3 games. There were 4 teams in the Gold category, 12 teams in Silver and 14 teams in Bronze. The prize distribution is such that there are 4 prizes for Gold, 3 for Silver and 3 for Bronze, so we still had a chance to get some prizes at this stage. This is a KOTH game and we were placed against HDB 3. JP played against Catherine, CC played against Joseph and I played against Sufarman. Was very lucky in my game as I had two bingos back to back with a DEGINRS and a AEHILNS rack. 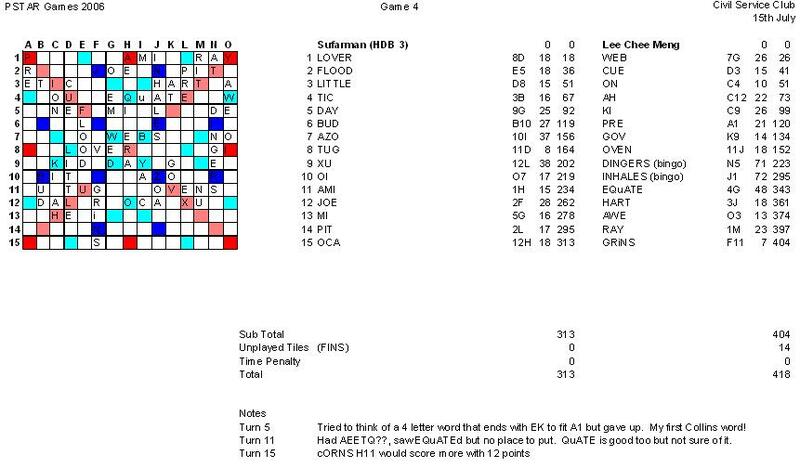 After that, I drew two blanks from the bag to form AEETQ?? on my rack which had two possible bingos by itself. Missed the eight letter bingo through an existing N. Scored not too bad with the "Q" for 48 points though. Won the last game 418-303. Our team won 3-0 and had a cumulative spread of 335 to come in tops for the Silver category teams! Ngee Ann Poly grabbed the top two positions in the Gold Category. Hope we could do even better next year! Game 4: There are front hooks for DAL...ODAL & UDAL. 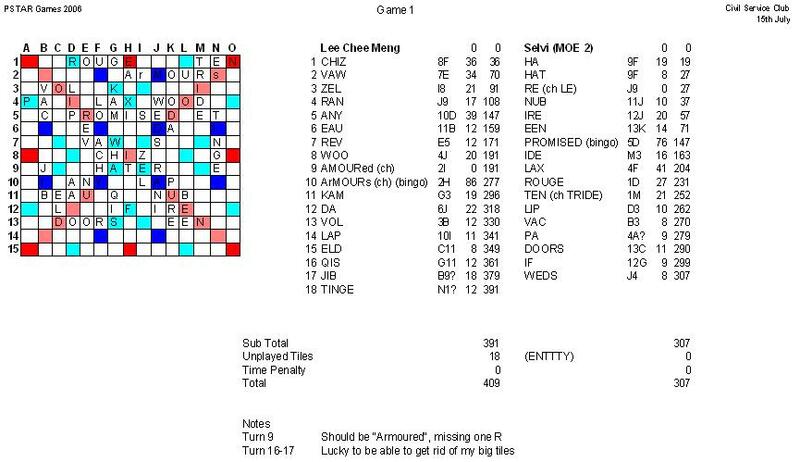 BTW, my opponents for game 3 & 4 are Sally (IRAS2) & Joseph (HDB3). There is a front hook for BIT too ... OBIT! 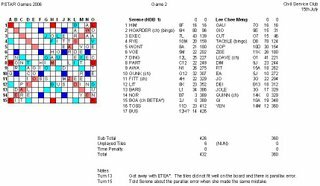 Two back hooks for LITTLE... R and S. Last move, I could have finished off with SNaR 14A for 18 points!